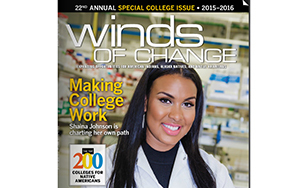 Winds of Change magazine has named St. Scholastica as a top college for Native American students. St. Scholastica was one of just five Minnesota colleges to be included on the list. It was compiled based on the latest information from the U.S. Department of Education's Postsecondary Education Data System. The list focused on statistics on degrees, graduation rates, and enrollment, as well as Native community support systems. According to the magazine's statistics, St. Scholastica has an overall Native American enrollment rate of 1.6 percent, slightly higher than the state of Minnesota's Native American population of 1.2 percent. Among undergraduates, a reported 2 percent are Native Americans. St. Scholastica offers a variety of financial aid programs geared toward Native American students, including its Native American Teachers Scholarship, and the Ge-naadamaagoyan Native American Scholarship. Its academic offerings include Ojibwe Language and Culture Education, Social Work, an American Indian Studies minor and Ojibwe language courses. Support organizations include the Indigenous Student Alliance and American Indian mentor/tutor programs.